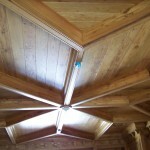 through sustainable forest management practices. 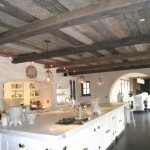 Reclaimed timber and antique lumber can be used as is. 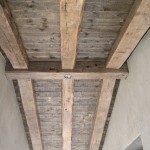 This means constructing with available dimensions and accepting character marks, bolt holes, nail holes, notches, seasoning checks and cracking. 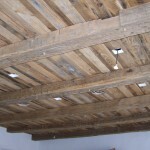 Reclaimedwood timbers have a beauty, density and quality that is unique. 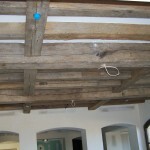 Reclaimed beams are sought after for historical significance because they are recycled from buildings built around or before the turn of the last century. 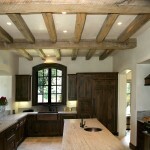 Our reclaimed timbers come from old growth forests harvested decades ago. 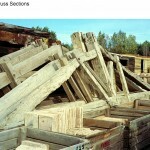 Recycling this salvaged wood also eliminates the need to cut our limit supply ofcurrent old growth forests. 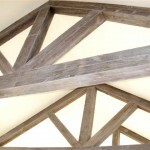 timber by its very nature, taking hundreds of years to mature, was notconsidered for replanting and is now replaced by faster growing timber. 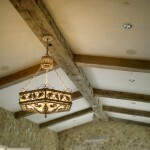 modern masterpieces, beams are always a very treasured interior accent. 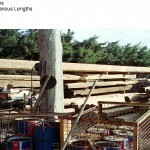 limited in width, length, and species to stock on hand. 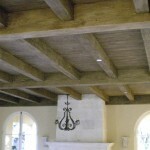 and/or different sanding techniques prior to delivery at additional cost. 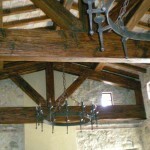 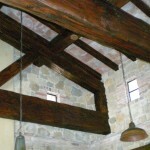 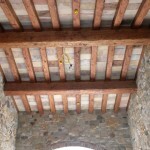 Traditional Materials offers a variety of wood beams obtained from old villas and estates both domestically and all throughout Europe. 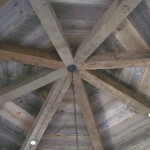 Traditional Materials creates texture and cut marks created by the saw blade which provide a timeless aesthetic that calls back to a time when the human relationship with nature was more hands on. 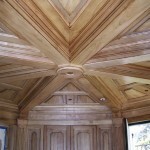 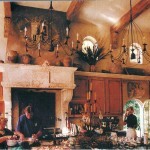 We value this process and cherish the opportunity to create a room that will never be forgotten. 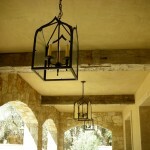 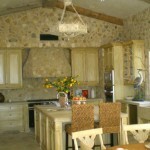 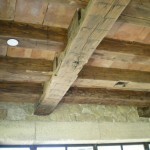 Solid hand- hewn beams make a fabulous addition to any interior or exterior project. 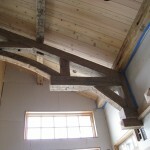 Solid hand hewn beams are best in a non-structural decorative design. 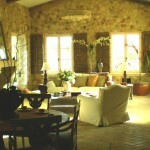 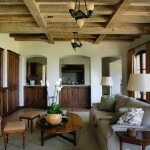 Antique hand hewn beams provide a robust, warm and comfortable vibe. Antique hand- hewn beams retain the original axe marks left behind by the gifted artisan who crafted them. 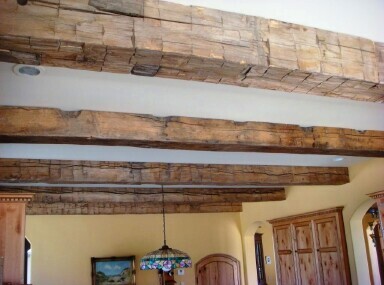 Antique rough sawn wood beams have a refined rustic appeal and include teeth marks from the actual blade once it was initially milled. 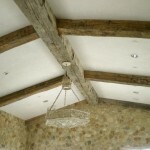 Sawn wood beams give a more finished look when exposed in any room of the estate. 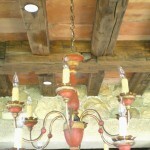 They may be rough sawn or sanded or planed smooth. 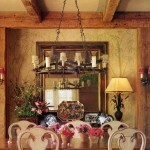 Sawn wood beams from Traditional Materials & Designs make beautiful accents as rails and mantels. 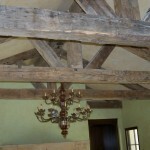 Antique Wood Beams- These beams with cutouts, peg holes and mortise cuts add to the authenticity and character of these wood beams. 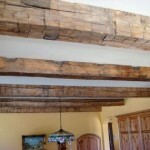 Some clients may want their antique wood beams to be clean without cutouts. 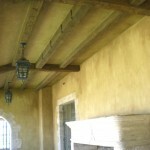 These requirements are almost impossible to find not to mention diminish the authenticity. 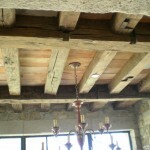 Keeping the integrity of the specie is vital when deciding to go with antique beams.